Jewish Academy of Orlando students score two and three grade levels ahead of their peers compared to national norms. For the fourth straight year, on average, students at Jewish Academy of Orlando performed at least two grade levels ahead of their peers nationwide. Each April, Jewish Academy students take the Iowa Test of Basic Skills, a nationally standardized achievement test for K-12 students. The test allows schools to compare students’ scores to national norms in Reading, Language Arts, Mathematics, Social Studies and Science. Check out the Jewish Academy of Orlando in the Focus On section of the Winter 2017 issue of J Life! J Life is a quarterly magazine written for and about the Jewish community of Central Florida. Support us while you shop this holiday season. Amazon will make a donation to the school when you shop through smile.amazon.com. They visited the Roth Family Jewish Community Center in Maitland to announce Florida’s $1 million budget plan for security funding at Jewish Day Schools. Please join us for a prospective and new family open house on Thursday, February 7 from 6:30 - 8:00 pm. Tour our school and discover the Jewish Academy difference. Learn more about how our students are changing the world. Come be part of our family. 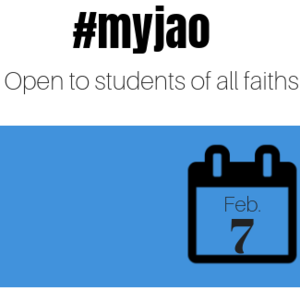 Open to all students of all faiths. 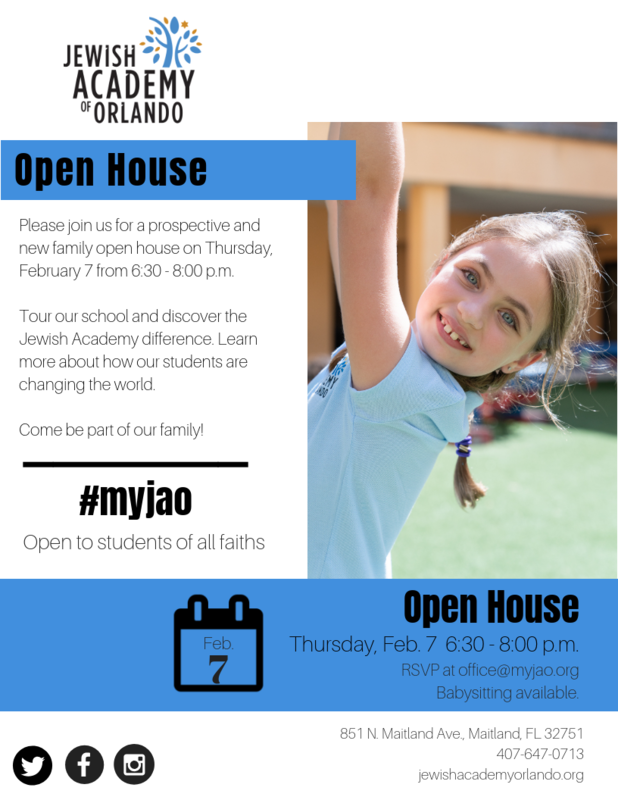 Please Join us for a prospective and new family open house on Thursday, February 7 from 6:30 - 8:00 p.m.
Tour our school and discover the Jewish Academy difference. Learn more about how our students are changing the world. 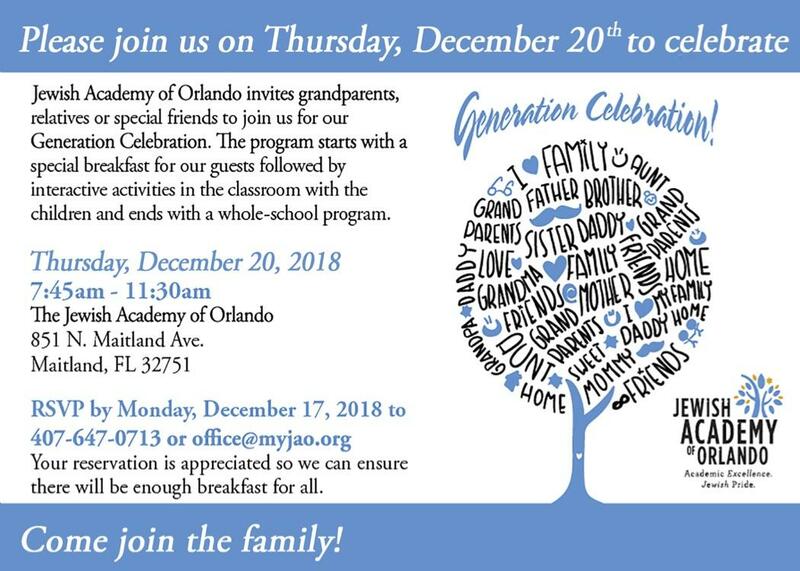 Jewish Academy of Orlando invites grandparents, relatives or special friends to join us for our Generation Celebration on Thursday, December 20, 2018, at 7:45 am. The program starts with a special breakfast for our guests followed by interactive activities in the classroom with the children and ends with a whole-school program. RSVP by Monday, December 17, 2018 to 407-647-0713 or office@myjao.org. The Jewish Academy of Orlando’s Annual Gala is our largest fundraiser of the year. These funds help support our academic programs and scholarship program. This event is a night for our parents, supporters and the community to come together and celebrate our school. 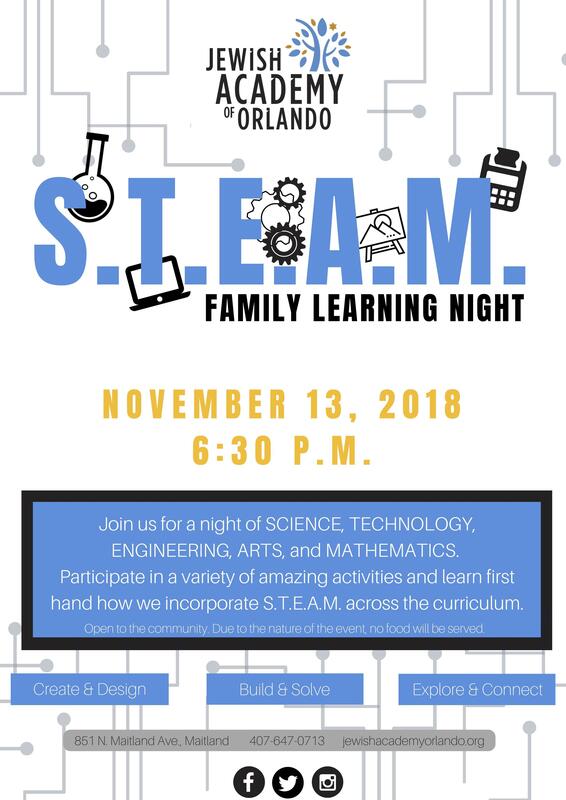 Join us on Tuesday, November 13th at 6:30 pm for a night of SCIENCE, TECHNOLOGY, ENGINEERING, ARTS, and MATHEMATICS. Participate in a variety of amazing activities and learn first hand how we incorporate S.T.E.A.M. across the curriculum. Open to the community so be sure to invite friends. *Due to the nature of the event, no food will be served.